Present state: The former 'up' platform is still extant and devoid of track immediately behind the later southbound platform. The Motorail terminal building still stands and is now used as a covered car park. 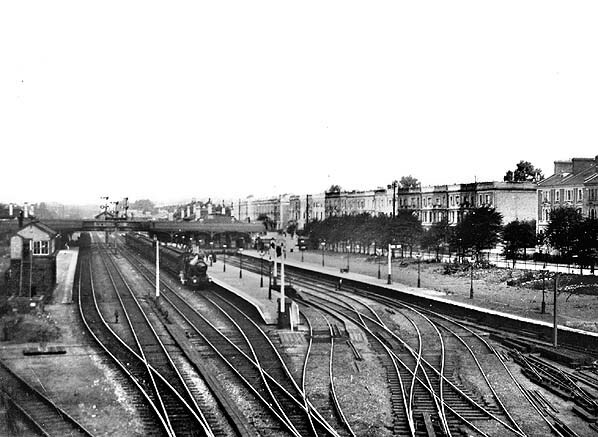 Notes: In November 1862 the LNWR introduced services from Camden and Harrow along the West London Railway to the old terminus at Kensington. 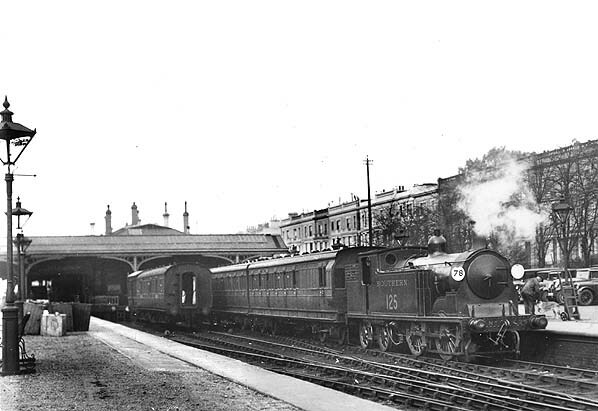 When the West London Railway fully reopened along with the West London Extension Railway on 1st April 1863 a third Kensington Station was under construction north of the second site but initially the second station was retained for this service until the new station was ready for use. 'scissors crossing' half way along allowing two trains to use opposite ends of the platform at the same time. On the west side there were a second pair of tracks and a similar scissors crossover but this was later removed. On the east side of the platform there were three lines serving two terminal bay platforms to the north of the station building and two further bay platforms to the south..
furrow' style canopy over the central part of the platform and round the end of the building. The bay platforms were left open. There was no entrance on the west side of the station which at that time was open countryside (before Olympia was built) occupied by the Royal Vineyard Nursery. platforms. 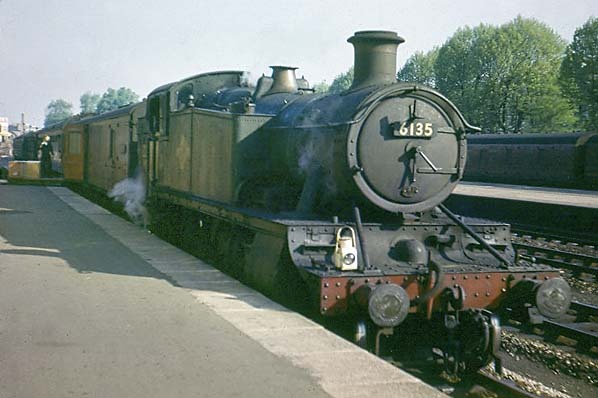 This service started on 18th July 1864 but was short lived running for four years on broad gauge track and a further year on standard gauge track before being withdrawn. 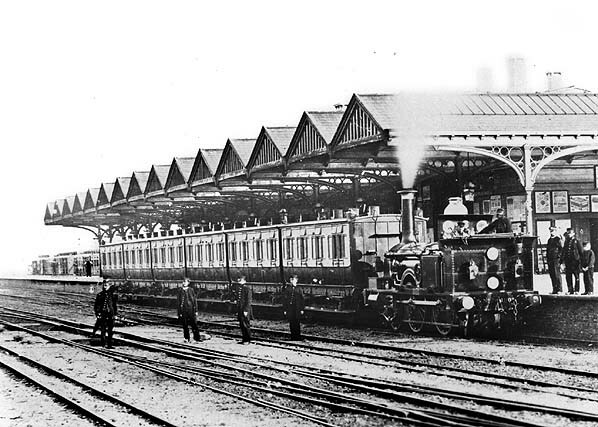 A second 1100 foot long platform was added on the west or 'down' side in 1868 to ease overcrowding with a second booking office provided in 1871. The building on this side was smaller but was protected by a similar length and design canopy with a footbridge linking the two platforms. A bay platform was added to the north side of the new platform for use by the LSWR when their service arrived from Richmond on 1st January 1869. A siding was added to the south of the station. There was intended to be another bay platform here and although the earthworks were started the platform wasn't built for another 80 years. When Kensington High Street Station was opened on 1st October 1868 the station was renamed Kensington Addison Road to avoid confusion with the new station. In 1930 the footbridge was replaced by a new bridge a little further south. Not only did the new bridge cross the four tracks but it was also extended into the exhibition building at Olympia. The old footbridge remained in use until it was demolished during WW2. 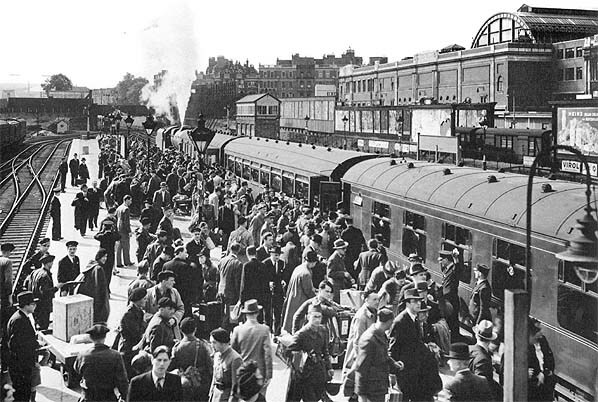 service to Clapham Junction was maintained throughout the war. 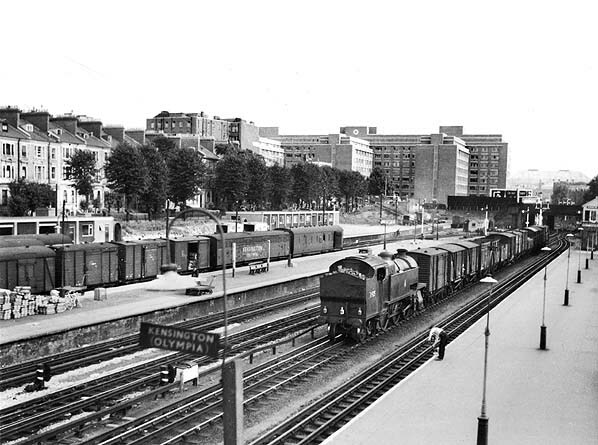 The line remained open for freight traffic including much war-related traffic and Addison Road was used as one of the main clearing stations for evacuation trains. At the end of the war, Addison Road was battered and roofless and with the impending threat of nationalisation there was no money available for repairs and improvements and the through service between Willesden & Clapham Junction was not reintroduced. Only the District line service from Earls Court was reinstated on 19th December 1946 when the station was renamed Kensington Olympia but this only ran when there was an exhibition at Olympia. 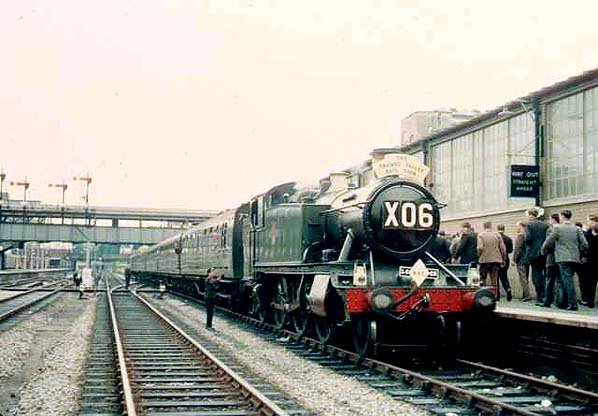 Initially these trains used the south end of the 'up' platform but as this meant crossing the line to reach Olympia so the south west bay was finally completed and brought into use on 3rd March 1958. The workers peak hour shuttle to Clapham Junction also continued to run. of improvement motorail facilities were discontinued at the end of the summer season and the terminal closed.. 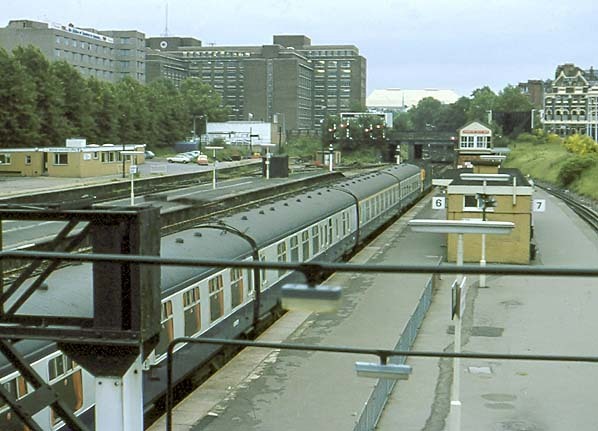 In 1983 all the bay platforms on the west side of the station were taken out of use and the track was lifted and the bays were filled between the platform edges. The site was then used as an additional car park for Olympia. At the same time the 'up' platform was cut at both ends and the track relaid as a siding with buffers at the north end with all station facilities being concentrated on the west side of the line. At the same time the crossings were removed allowing higher train speeds on the through lines. This marked a low point in the history of the station. 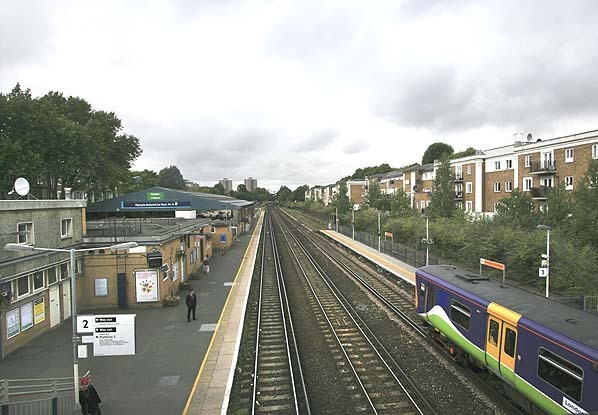 In 1986 the District Line recommenced a full service, joined in 1994 by a rejuvenated service on the West London Line, from Willesden Junction to Clapham Junction and from Watford Junction to Brighton. To accommodate this, a new shorter platform was built on the west side of the line. Today the station is relatively quiet compared to its busy past. A large number of freight trains pass through the station, as the West London Line is the main freight route from north of London to the south-east of England and the Channel Tunnel. station was to play an important role in the Cold War should a nuclear exchange have seemed likely. The station was part of the secret plans to evacuate large numbers of civil servants to the Central Government War Headquarters underground nuclear bunker at Corsham in Wiltshire during the period leading up to a nuclear war. Kensington Olympia was also a backup terminus for the Eurostar services in the event that Waterloo International became unusable in an emergency. Until the move to St Pancras, immigration facilities were maintained at Kensington Olympia for this purpose and possibly also because of the aborted plan to run Eurostar services from regional stations in the UK through to the continent. 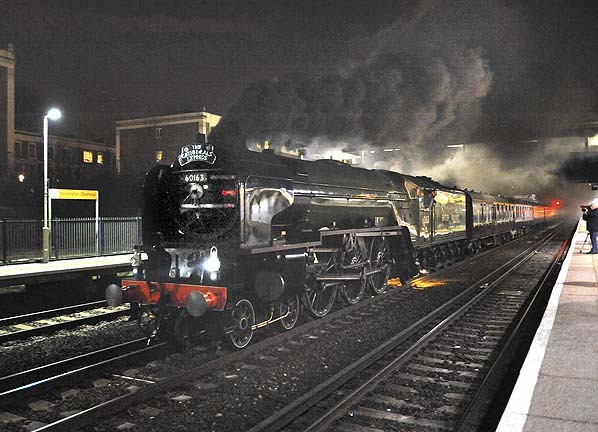 service ran between Clapham Junction and Kensington with two trains in the morning rush hour and two in the evening. This service received little promotion and most people were unaware of its existence. Most of the conductor rails between Kensington and Willesden were removed between 1946 - 1952. Kensington Addison Road Station 'up' platform looking north in early 20th century. 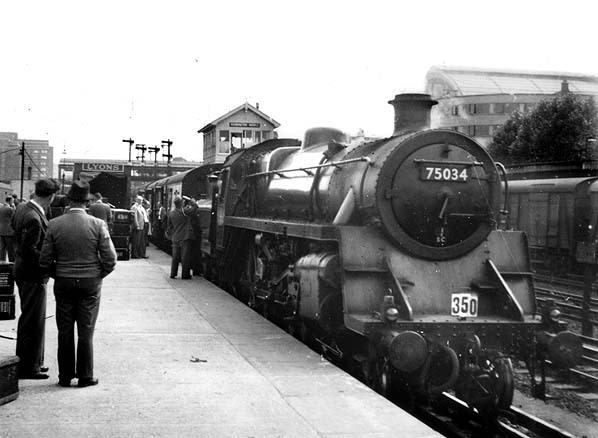 Stephenson Locomotive Society London Area Rail Tour at Kinsington Olymbia station on 12 September 1953. The tour started and finished at Olympia running via Willesden Junction HL - Gospel Oak - Harringay Park Jn - Harringay Jn - (via goods line) - Hatfield - Welwyn Garden City - Ayot - Harpenden East - Dunstable North - Leighton Buzzard - Winslow - Claydon LNE Jn - Calvert North - Quainton Road - Aylesbury - Princes Risborough - High Wycombe - Gerards Cross - South Ruislip - Greenford - North Acton - Viaduct Jn. Clapham Junction stands in Platform 6. 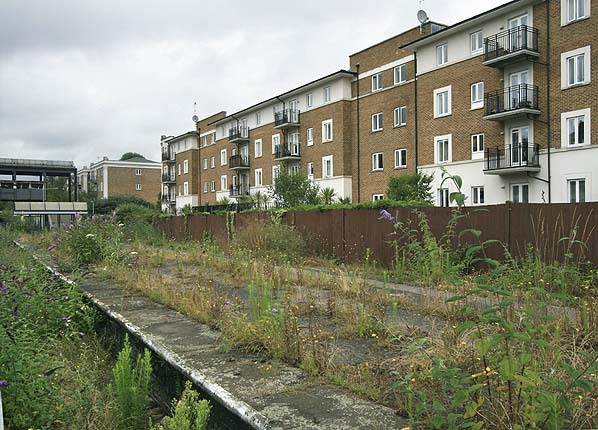 The disused former 'up' platform at Kensington Olympia Station in July 2009. The flats stand on the site of the south east bay platforms.